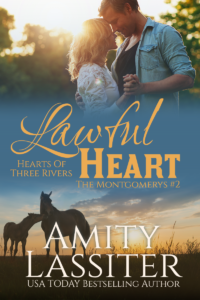 Banks Montgomery takes his job as youngest sheriff ever elected in Three Rivers very seriously; the residents of the small town are his family and he takes care of them accordingly. Along with his small horse breeding operation, he’s a man with a plan—one that doesn’t include the distraction of a woman, least of all one that turns up out of nowhere and isn’t what she seems. Pregnant and abandoned in Three Rivers, Norah Clarke needs to come up with a plan, and fast. Fortunately, she’s always been quick on her feet, and she and the town go way, way back. That doesn’t, however, prepare her for the town’s nosy (and devastatingly handsome) sheriff and all the surprising ways he makes her feel. When the distraction Norah brings proves to have painful consequences, Banks will have to decide if his comfortable, predictable life is worth putting on the line for the sake of his heart.